This weekend we got some new information about the highly anticipated Generation III Pokemon remakes entitled Alpha Sapphire and Omega Ruby thanks to the Japanese gaming magazine called Corocoro. With confirmation on returning game mechanics, new Mega Evolutions and the possibility of newly expanded post game, these remakes not only build upon the original Sapphire and Ruby versions, but also upon Pokemon X & Y as well. Although the most striking reveal might just give us a glimpse into why these versions are titled ‘Alpha’ and ‘Omega’. Since these are remakes, you can expect a lot of elements from the originals to be found in them. The Acro Bike will return allowing players to not only perform tricks, but also reach otherwise inaccessible area. Though if you prefer good ole speed, then you’ll be happy to know the exceptionally fast, yet hard to control Mach Bike will be returning as well. 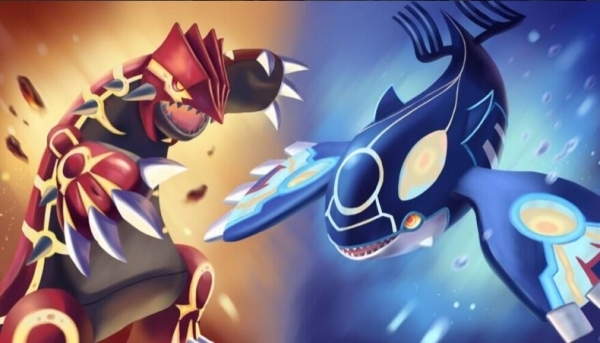 The story elements may change slightly considering Groudon’s and Kyogre’s new forms – which I’ll get to in a bit – but your adversaries remain the same. Team Aqua and Team Magma will return for their respective hoping to once again flood the land or dry the seas. With newly updated artwork and modernized looks, they might seem different; but their leaders and high ranking officers all retain their original names and roles. There’s yet to be any word on Pokemon Beauty Contests, but it’s likely those will return as well. As for what else will be added, we’ll have to wait and see; but hopefully some new lands are indeed added. Though before we can explore new lands in Hoenn, let’s explore new forms of their Pokemon. Pokemon X & Y introduced us to the notion of Mega Evolutions, where a Pokemon can evolve with the help of a special stone – and a Mega Ring Accessory – into a much stronger version of itself for the duration of battle. Alpha Sapphire and Omega Ruby will continue this mechanic via the Mega Bangle. It’s not yet clear whether this Mega Bangle is just a simple name change since the Mega Ring wore more like a bangle (bracelet) or if this Bangle will be a much stronger version of the Mega Ring and allow more than one Pokemon to Mega Evolve during the match – or even carry the stones seperately. All we do know right now is that three new Mega Evolutions have been confirmed; but whereas two were completely expected, the third was not. When Mega Blaziken was revealed for Pokemon X & Y, everyone wondered when the other Generation III starters would get Mega Evolutions. All of the Generation I starters had Mega Evolutions, so Generation III had to have some too right? The Forest Pokemon Sceptile – the fully evolved form of grass starter Treecko – is the first to have a new revealed Mega Form; and it looks awesome! 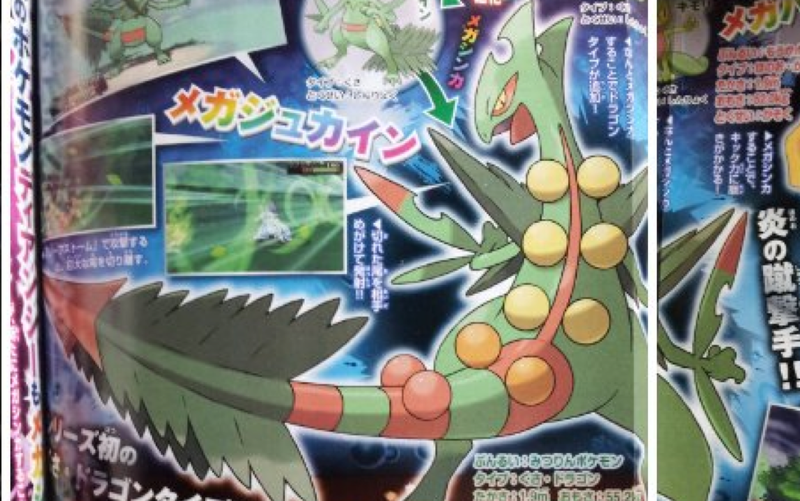 Mega Sceptile grows a bit in size and weight and gains the new dual type Dragon/Grass. This dual typing has never occurred before, and though this one of a kind Pokemon certainly looks awesome, you must remember it will have a x4 weakness to ice attacks. Throw in Dragon types newly added weakness to Fairy types; and you have a Pokemon that might get into trouble often. Though despite these more exploitable weaknesses, it’s special ability becomes Lightning Rod which will not only make it immune to electrical attacks, but also increase its special attacks whenever hit by one. Also, considering it can draw electrical attacks away from teammates in double battles, this could come in handy for Metagamers. Much like its Generation III brothers, the water starter Mudkip gets a Mega Evolution for its final form as well. Swampert, aptly named the Mud Fish Pokemon, gains a Mega Evolution that maintains its Water/Ground dual typing, but bulks up sufficiently. 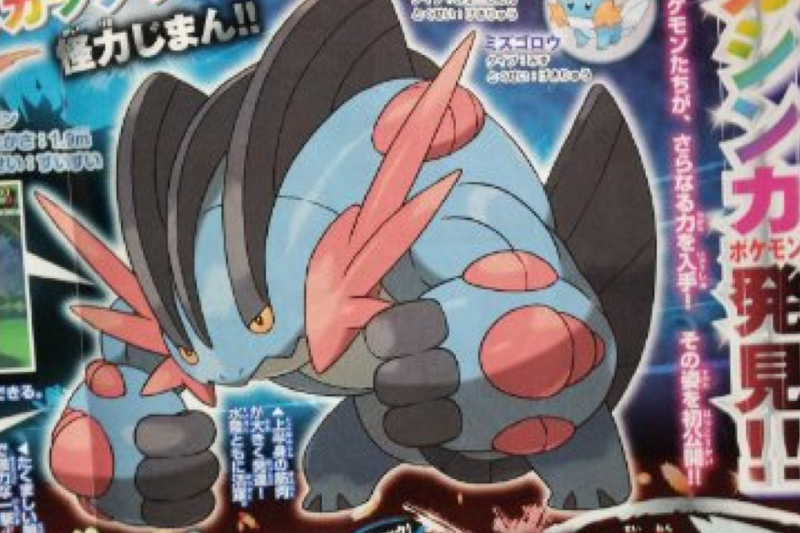 As with normal Swampert, Mega Swampert will only be weak to Grass attacks; but it’s at a x4 weakness. The other problem with Swampert usually is it’s speed stat, but thanks to it’s new Swift Swim ability, a little rain in battle will immediately double his speed making him a much more balanced competitor – and good teammate for Kyogre. 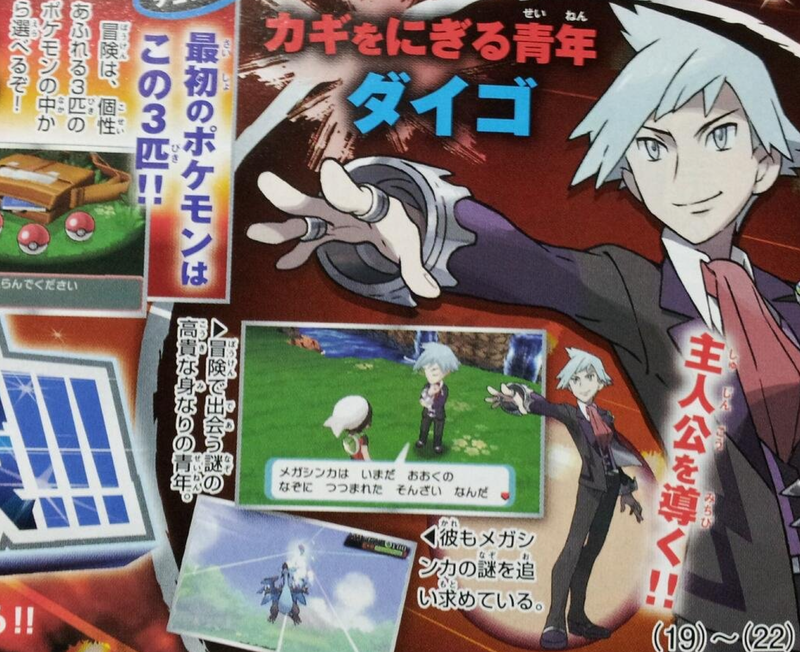 If we were going to learn about more Mega Evolutions, I’d assume Generation II should get some – since I and III already have – or at least Metagross since he is the ace monster of Pokemon Champion Steven Stone. Instead of any of these, we get a Mega Evolution of a Pokemon that hasn’t even been officially released yet. As I spoke of a long time ago, Diancie is a special event Pokemon that was discovered in the Pokemon X & Y code. We’ve gotten more details on this Pokemon – and its other two hidden legendary friends – but we have yet to have it released in the game. This is still an odd case and not much is known about its Mega Evolution either. 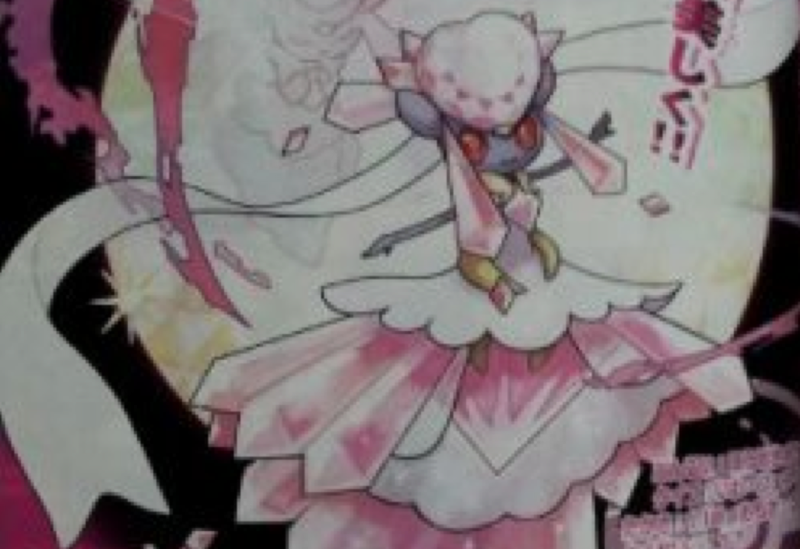 The Jewel Pokemon Diancie maintains its Rock/Fairy typing and what its ability will be has yet to be released. All things considered, the design looks great, but I can’t help but feel there are many more deserving Pokemon out there. Mega Evolutions are basically a way to reinvent old Pokemon and give them an evolution without giving them an evolution. To give a Mega Evolution to a Pokemon we STILL have to meet just seems a little wasted. Mega Evolutions aren’t the only evolutionary device in this game. Alpha Sapphire and Omega Ruby will introduce a new mechanic called Ancient Devolution in which a Pokemon will return to its Prehistoric/Primal/Primeval form. The two examples of this are actually on the Box Art: Prehistoric Groudon and Prehistoric Kyogre. Since these are both massive Pokemon that control the continents and seas, how do they become stronger. Well ff they’ve been slumbering for so long – as the Ruby and Sapphire storylines usually go –, then their powers would surely have weakened over time from lack of use. By returning to their original forms, their bodies would reflect when the planet was in a more tumultuous time. But since these aren’t Mega Evolutions, we need more information because Ancient Devolution could mean one of two things. For starters, it could be a one-time thing like the DNA Splicer in Pokemon Black and White 2? Plenty of fans would have loved to splice more than just 3 Pokemon together, so it was sad that it was only available for the 3 main Legendaries in those versions. As such, there’s a very strong chance the same might happen with the Ancient Devolutions and it’ll only apply to Groudon, Kyogre and possibly Rayquaza. The alternative is that it is a new form of evolution, but then what other Pokemon have Prehistoric forms? We have an entire class of ‘Fossil Pokemon’ – one of which has a Mega Evolution, Aerodactyl. So what does Ancient Devolution mean for them? Will they get one, or are these already their Devolution forms since they’re revived that way? Then would that make Mega Aerodactyl a modern day Aerodactyl that didn’t go extinct. Oh God, I’m confused. So before I hurt myself in confusion, let’s just agree that Ancient Devolution needs more information before we decide where and how this fits into the world of Pokemon. One thing I found off putting about Pokemon X & Y was the lack of Post-Game quests. Whether it was exploring some new cities, catching tons of legendaries, or traveling to a whole new region from another game, past installments have always had sufficient reasons to drive you to train harder and keep becoming stronger. Now the original Ruby and Sapphire versions didn’t have too much post game; but they did still have contests and battle frontier to help push you onward. Though thanks to the new reveals, we might actually have even more reason to train. 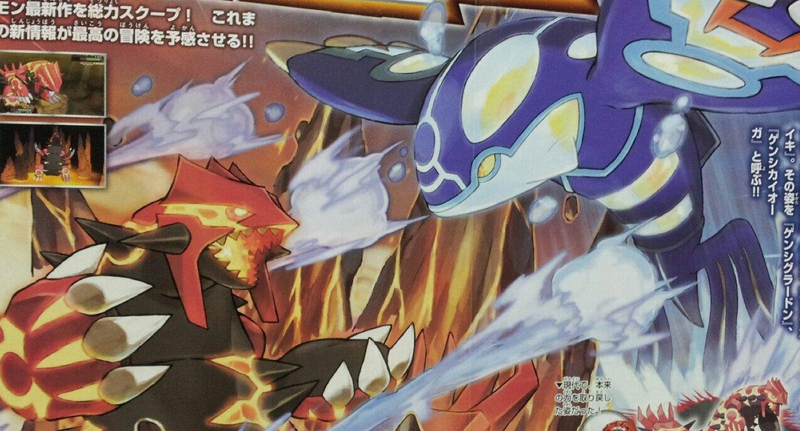 In the Corocoro issue we see a picture of Steven and Mega Charizard X. Now Charizard was never one of Stephen’s initial Pokemon party members, but with him being a Pokemon Champion and all, I think its doable that he’d have one – especially a Mega form. The most interesting thing about this is that it appears that the Charizard in question is Level 100. If that is the case, then there will have to be some sufficient training and post game activities to help drive you forward in beating the Pokemon Champion once and for all at such high levels. As always, subscribe here and on Facebook to keep up to date with the latest Pokemon news. With E3 this week, there might be a chance we’ll see some more news soon. So again, stay tuned trainers! ← Mark Hamill Gives Fans the Ultimate Star Wars & Batman Crossover!